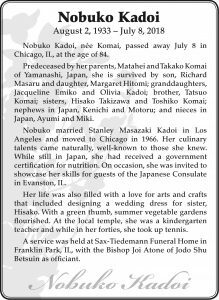 Nobuko Kadoi, née Komai, passed away July 8 in Chicago, IL, at the age of 84. Predeceased by her parents, Matahei and Takako Komai of Yamanashi, Japan, she is survived by son, Richard Masaru and daughter, Margaret Hitomi; granddaughters, Jacqueline Emiko and Olivia Kadoi; brother, Tatsuo Komai; sisters, Hisako Takizawa and Toshiko Komai; nephews in Japan, Kenichi and Motoru; and nieces in Japan, Ayumi and Miki. Nobuko married Stanley Masazaki Kadoi in Los Angeles and moved to Chicago in 1966. Her culinary talents came naturally, well-known to those she knew. 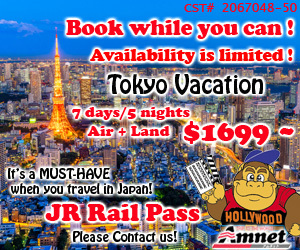 While still in Japan, she had received a government certification for nutrition. On occasion, she was invited to showcase her skills for guests of the Japanese Consulate in Evanston, IL. Her life was also filled with a love for arts and crafts that included designing a wedding dress for sister, Hisako. With a green thumb, summer vegetable gardens flourished. At the local temple, she was a kindergarten teacher and while in her forties, she took up tennis. A service was held at Sax-Tiedemann Funeral Home in Franklin Park, IL, with the Bishop Joi Atone of Jodo Shu Betsuin as officiant.